The 1st reason make no sense at all because the edit was intended to explain the question with and example and not to address the author of the post. This edit deviates from the original intent of the post? and why isn't it obvious that this was the OP's question? 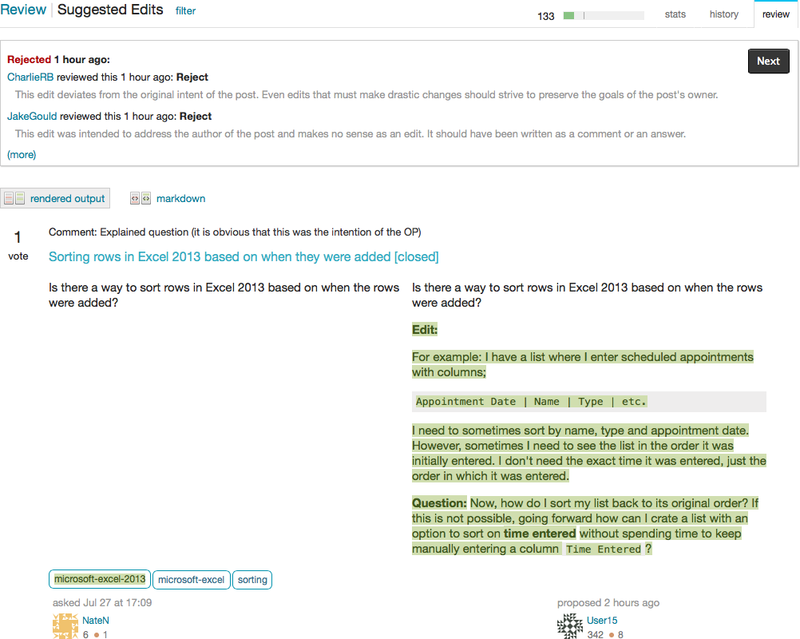 Your edit certainly makes the question clearer and more answerable, but it's not certain that the OP intended to mean what you wrote. You're assuming they're entering a list of items sequentially by using a new row for each item, and not updating those rows later. If you have to take into account row updates, you'd need an automatic "last modified" timestamp for each row and then sort by the timestamp. To get clarity on the exact situation of the OP, we'd better ask them, not just assume they mean what you think as illustrated above. If the OP comes back and helps us out with some more info, then we can reopen the question. As one of the community members who rejected your edit, it clearly overstates what you believe the question to be is far from a simple enhancement; you are putting major chunks of words and ideas in the original poster’s mouth by creating an edit of that size with new content. Screenshot of the rejected edit below for reference. Not only is this bad practice in general, in this case a new user with a vague question basically get’s their question hijacked and what message does that send to them? What you should be doing instead is requesting the user clarify their question a bit more in the comments. Clearly state they should edit their own question to add context. If they don’t you can’t help them any further. If they somehow comment to you directly with details then—and only then—should you give them an “assist” by taking their detailed comment and integrating it into the question. But as it stands, you cannot presume to edit anything to the degree you attempted to and simply expect it to be accepted just because it seems better to you. Your edit seems to assume a detailed knowledge of OPs problem that exists in no form anywhere near their question or answers. While it is good that you are trying to clarify their problem in order to get them an answer, from the reviewers perspective it seems more like you are adding detail of a problem that you are having in an attempt to hijack the question. The current question is unclear, if you have a question that is somewhat similar but you can make it a lot more clear and useful then it would be much more beneficial if you asked your own question instead. Not the answer you're looking for? Browse other questions tagged discussion closed-questions specific-question reopen-request suggested-edits . Can other users edit my posts without my approval? Approve this question edit by another user?